As we are inundated with data via infographics and other visualizations, it is essential that students learn to read and analyze these types of visual communication. Analyzing sample infographics in your field and introducing students to Randy Olsen’s “Infographics Lie. Here’s How To Spot The B.S” can help students critically engage with these types of visualizations while developing important visual literacy skills. I love using assignments that ask students create real world products, not only because it provides them the opportunity to develop valuable life skills, but also because it allows them to communicate with audiences beyond our classroom. 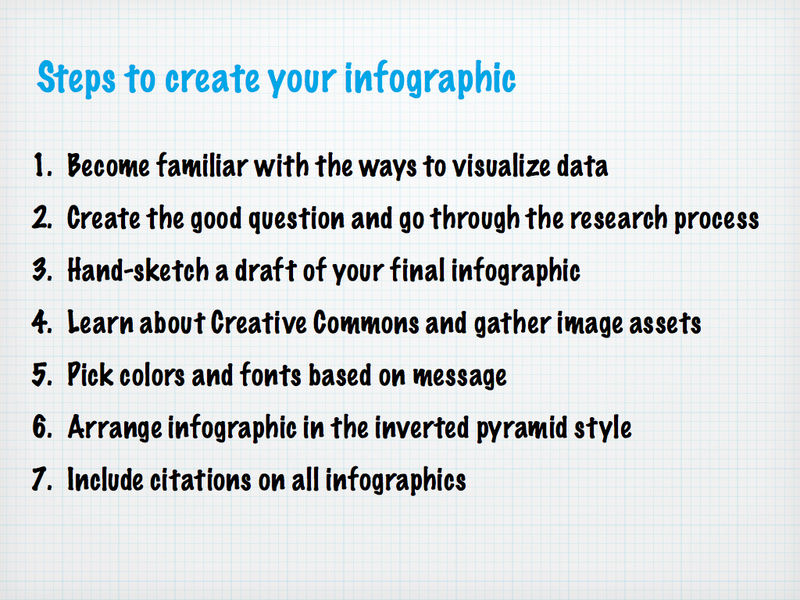 Asking students to create an infographic also provides them with a different, more visual technique of communicating what they learned, while also providing them with a marketable skill as well as a product they could later embed in a portfolio. Creating infographics requires: 1) knowledge of basis styles of infographics, 2) access to an infographic tool (and there are great free ones! ), and 3) some basic knowledge of quality design. Step 1: To familiarize your students with the types of infographics available, there’s a great 2.5 minute video produced by Easelly. By describing different types of infographics that are common, students can brainstorm what type of infographic might fit their needs. Step 2: Help students access an infographic tool. There are many fabulous free tools, though my favorite is Canva. Canvas offers free accounts to faculty and students, and it allows students to create infographics, in addition to invitations, posters, and other media. Although there are many other free tools available, you may find that some have dramatically limited the features available in their free version, and some will not even allow you to export without upgrading to a paid account! Step 3: Help students understand some fundamental principles of great design and infographic creation. You might also plan time for students to draft their infographics together, as well as peer reviewing infographics along the design process. Consistency: Stick to consistent fonts, color patterns, and theme throughout the infographic. More is not always better: It can be tempting to fill an infographic with tons of graphics, fonts, bubbles, text boxes, and other visual icons, but be wary of clutter and edit your design. Documentation: Include citations/references and credits, in addition to a byline for themselves. Audience: Consider your desired audience when formatting your design. Pinterest and websites can accommodate long images, while Instagram is limited in the size it can accommodate. Refer students to this infographic for an excellent introduction to infographic planning and design. Go Low-Tech: Have students hand-draw infographics as part of an in-class assignment. You can also look to visual notetaking as a rationale for doing this. Teaching students other modalities for taking notes can offer them new techniques to better record their thoughts, as well as helping them develop a visual vocabulary/shorthand for notetaking and visual communication. For more resources, check out The Power of Visual Notetaking and An Introduction to Visual Notetaking. Incorporate infographics into your classroom: Use them to communicate information to students, as sources for students to analyze, or other points of reference for your students. 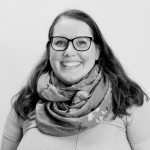 April Lawrence, “The Whats Whys and Hows of Infographic Assignments.” An excellent rationale for incorporating infographics into the classroom. Donna Moritz, “7 Superpowers Of A Knockout Infographic That Drives Traffic And Shares Information,” Socially Sorted. Details seven accessible design and planning principles for infographic design. Latasha Doyle, “How to Make Infographics With Students: Recap & Replay,” Easelly (2017). Contains notes & slides on how to teach infographics, including information on teaching outlining and design. Kathy Schrock, “7 Steps to Create your Infographic.” A slide with seven steps for students to use in designing an infographic. Will Fanguy, “Using Infographics in the Classroom,” Piktochart. Instruction in how teachers can design infographics to use with their students, including several interdisciplinary examples + bonus an infographic for teachers designing infographics. Randy Olsen, “Infographics Lie. Here’s How To Spot The B.S.” Teaching students to understand infographics and other visualizations is a key component to visual literacy. Kathy Shrock, “Infographics as a Creative Assessment.” A wealth of resources on creating infographics – infographic overviews, samples and design tools, as well as guides to creating infographics and using infographics in the classroom. Dr. Wieck is a 20th- and 21st-century U.S. historian specializing in urban spaces, race, the West, and digital and public history. Wieck teaches graduate and undergraduate public history classes at St. Mary’s University in San Antonio, Texas. She is working on a manuscript entitled, The Mission Impossible: The Cultural Politics of Community and Gentrification in Postwar San Francisco. I’m currently co-developing an infographic assignment in conjunction with my work as the Curriculum Coordinator for The Encyclopedia of Milwaukee (emke.uwm.edu) – this post is so helpful. My thanks to you for creating this resource!